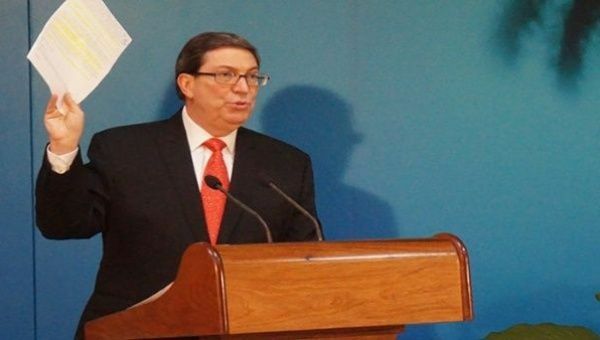 The Minister of Foreign Affairs of Cuba denounced that the government of the United States carried out a new political maneuver aimed at justifying the economic blockade on the island. Oct 24 (teleSUR) The Minister of Foreign Affairs of Cuba, Bruno Rodríguez Parrilla, denounced on Wednesday that the United States government is carrying out a new political and diplomatic maneuver aimed at justifying the economic, financial and commercial blockade against the island. In addition, the Foreign Minister pointed out that the Permanent Mission of the United States Before the UN, since Tuesday night, has been pressing countries to change their position in the run-up to the vote of the resolution condemning the blockade at the United Nations, which will be held on October 31. With this aim, Rodriguez announced that the US diplomatic mission is circulating a document that brings together eight amendments to the resolution condemning the blockade that annually all countries vote virtually unanimously in the UN General Assembly. “It is the duty of any diplomat to defend the truth (…), to prevent the violation of procedures and the attack on sovereign states,” Rodríguez added. Since 1962 the U.S. has blockaded Cuba economically, commercially and financially. Listed as the longest in the history of mankind, the blockade affects every form of development of the Caribbean country. It constitutes a flagrant, massive and systematic violation of the human rights of the Cuban people and is rejected in the world.